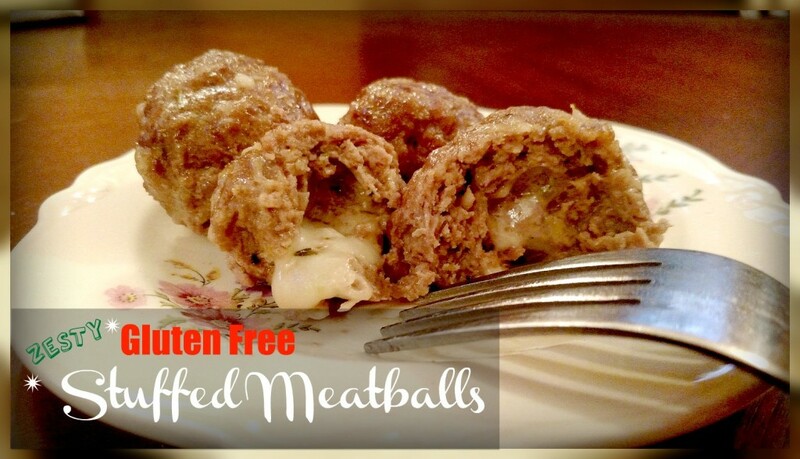 Whether you eat them for dinner or for appetizers at parties, every foodie needs a amazing gluten free meatball recipe in their back pocket. Until a few years ago, I never realized how much gluten was used in just about every family recipe I had. As a result, I am constantly finding myself redoing old recipes in my Momma’s recipe collection. But that’s okay, it gives me a chance to blend old and new and add my own personality to my family favorites. I was scrolling through Pinterest a couple weeks ago (big time zapping rabbit hole right there!) and I saw an awesome looking stuffed meatball recipe. I thought, yeah, baby, having meatballs tonight! Then I read the ingredients and it used breadcrumbs. So I started looking at ways to remake it into a low carb and gluten free meatball recipe, and it didn’t take long until I figured out a way to make deliciously stuffed gluten free meatballs. Breadcrumbs are the key to making traditional meatballs stick together, so what to use in place of it? I decided to fall back on a low carber’s binding staple: Parmesan cheese. I wanted a little to give the meatballs a boost of flavor and moisture. I added finely chopped onions to my gluten free meatball recipe. The key, though, is to make sure they are chopped extremely fine or else you just end up with lumps of onions in hamburger meat. 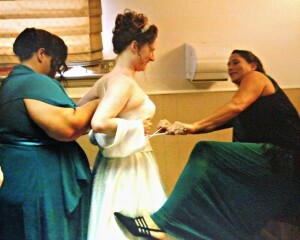 When my husband and I got married, he brought his Ninja Chopper with him. I’m knife challenged and, oh, my gosh, I love that thing. It chops vegetables finer than I could ever do by hand, plus it does it in less than 30 seconds. It makes the onions just the right consistency to add moisture and flavor to the meatballs. I wanted my meatballs to be zesty, but not so hot I couldn’t stand it. I added just enough of Frank’s red hot to give it a little kick, and then stuffed them with cubes of pepper jack cheese. I made these into two to three inch meatballs because I was having them as the main course for dinner. But if you made them into one inch balls instead, these would make awesome gluten free meatball appetizers for New Year’s, a Superbowl party, or potluck dinner. I always like to bring something like this to parties and get togethers when I’m asked to bring something, because it gives me at least one thing I know I can eat. The bonus is that these meatballs taste so great, everyone else can enjoy them, too, and not even know they’re gluten free. Remember those yummy BBQ crock pot meatballs that everyone always brings to parties? (that you can’t eat!) Make these gluten free meatballs, add some low carb barbecue sauce, and let simmer in the crock pot for awesome low carb meatball appetizers. Let’s Make My Gluten Free Meatball Recipe! 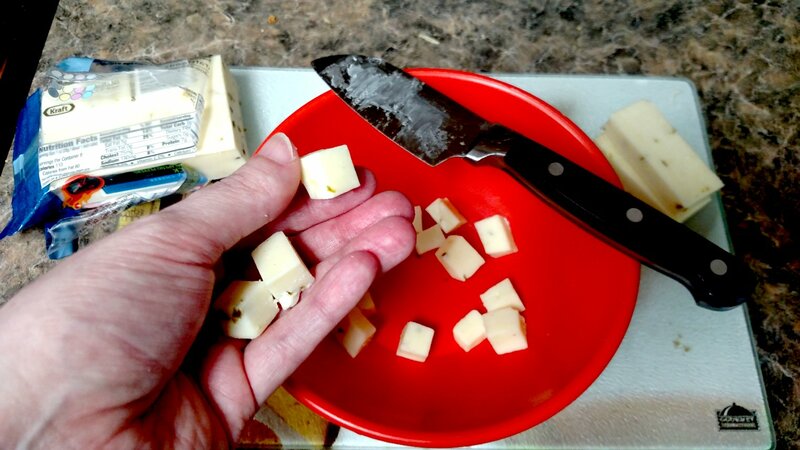 First, cut pepper jack cheese into 24, 1/4 inch cubes. 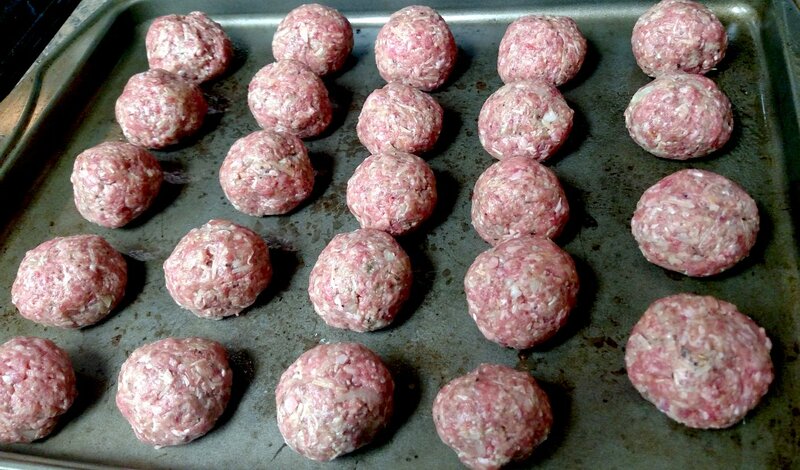 If you’re making gluten free meatball appetizers, cut 40 cubes. Set aside. 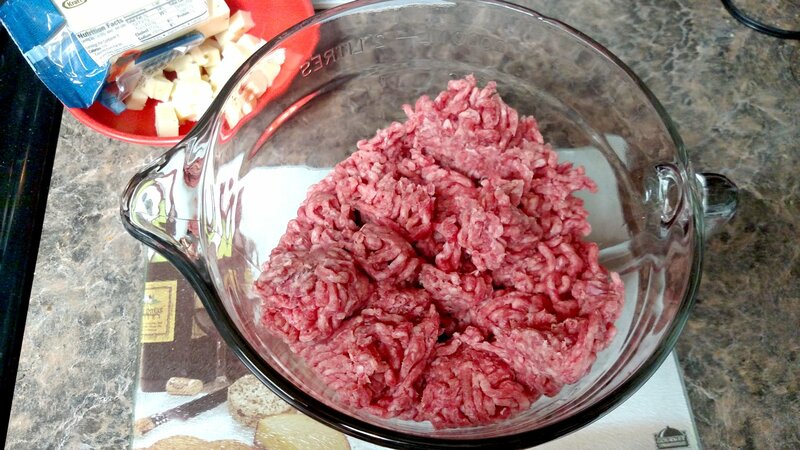 Place two pounds of ground beef into a mixing bowl. 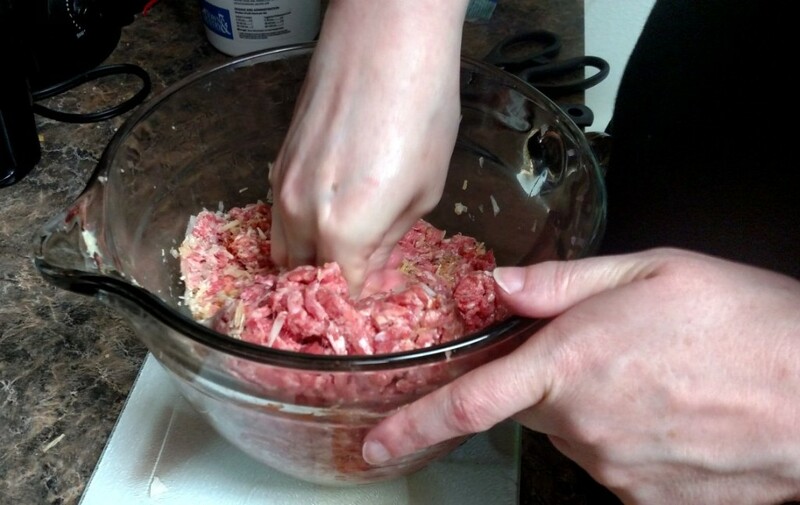 You can use all beef, or half ground beef/half ground pork. I actually found a hamburger/ground pork mix at Wal Mart so I used that. It’s so much more convenient and economical! 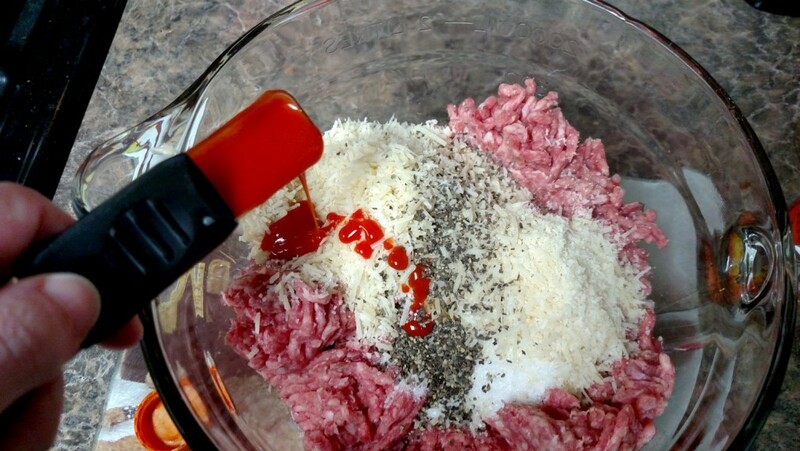 Add the egg, Parmesan cheese, Frank’s Red Hot, garlic paste, salt, pepper, and spices to the ground beef/pork. Peel a medium sized onion and finely chop half of it. I used my Ninja Chopper for this. Okay, I’m lazy. But why would I ever chop onions by hand when I can get this result in less than 30 seconds? 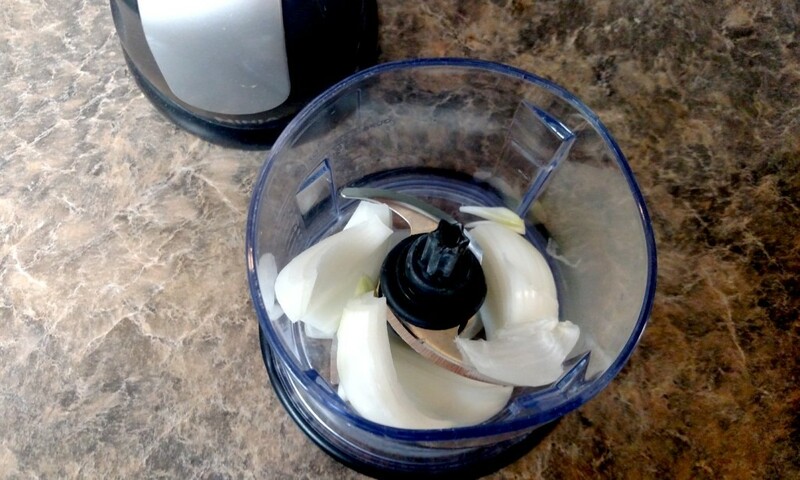 Add chopped onions to the bowl and blend everything together well, but being careful not to over mix. You don’t want tough meatballs! 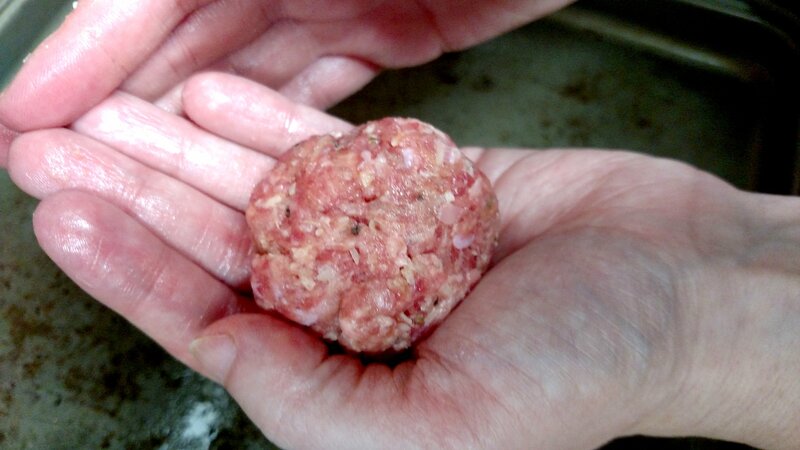 If you’re making dinner-sized meatballs, form into two inch balls. 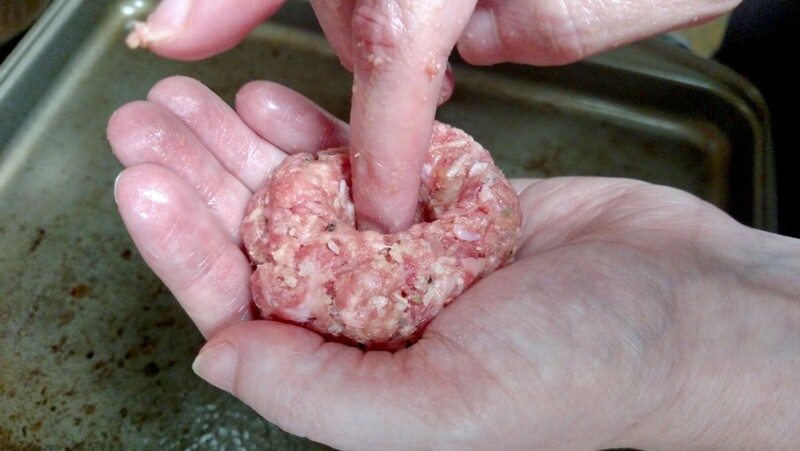 For appetizer sized meatballs, form into one inch balls. Form an indention in the middle with your finger. 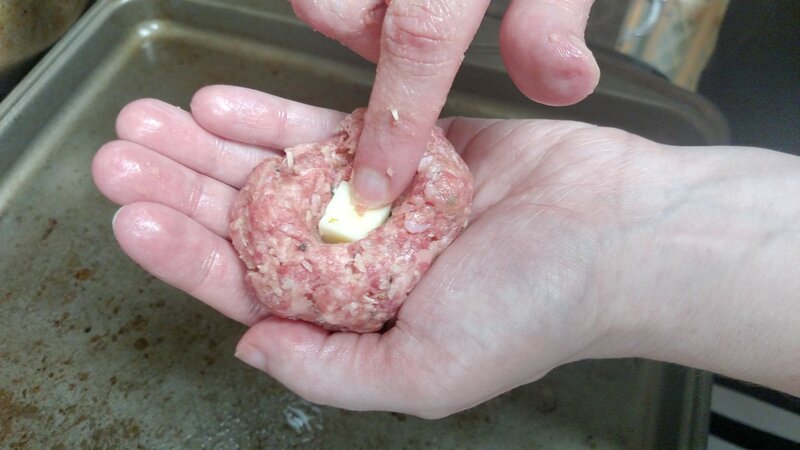 Place a cube of cheese in the middle of the meatball, and reform the meat around the cheese. Be sure to seal the cheese in really well, otherwise it will leak out during cooking. Place them on a greased cookie sheet and bake at 350 degrees for 25 minutes, or until done. Serve and enjoy! Cut pepper jack cheese into 1/4 inch cubes. Set aside. Mix remaining ingredients together, being careful not to over mix the meat mixture. Form into two inch balls. Poke your finger in the ball and place a cheese cube into the hole. Form meat back around the cheese. Bake at 350F for 25 minutes, or until cooked through. I Just Want to Make Low Carb Hot Chocolate Taste Good! Hot chocolate is my all-time favorite hot beverage. I’m not talking about the stuff you get in packets. I’m talking good, old fashioned homemade hot chocolate. It’s almost Christmas, and I’m starting to get the warm and fuzzies. 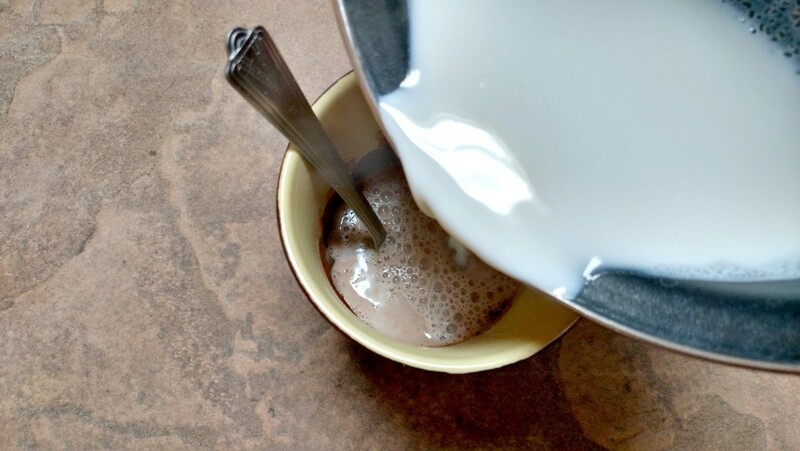 I’ve been craving a good cup of hot cocoa, and I literally have tried every low carb hot chocolate recipe and low sugar hot chocolate recipe I’ve come across. I ended up throwing them all out because they’ve been too weak, not sweet enough, or just have had an off taste. My favorite recipe used to be the one that was on the back of the Hershey’s cocoa box, so at first I just tried to adapt it a bit to make it carb friendly. I tried to use alternative sweeteners in place of the sugar, but it was a no-go. It just didn’t taste like hot cocoa is supposed to taste, ya know? It is really hard to make low carb hot chocolate taste good! There were elements to each low carb hot chocolate recipe that I liked, so I kind of put them all together and made my own recipe. The results? OMG. 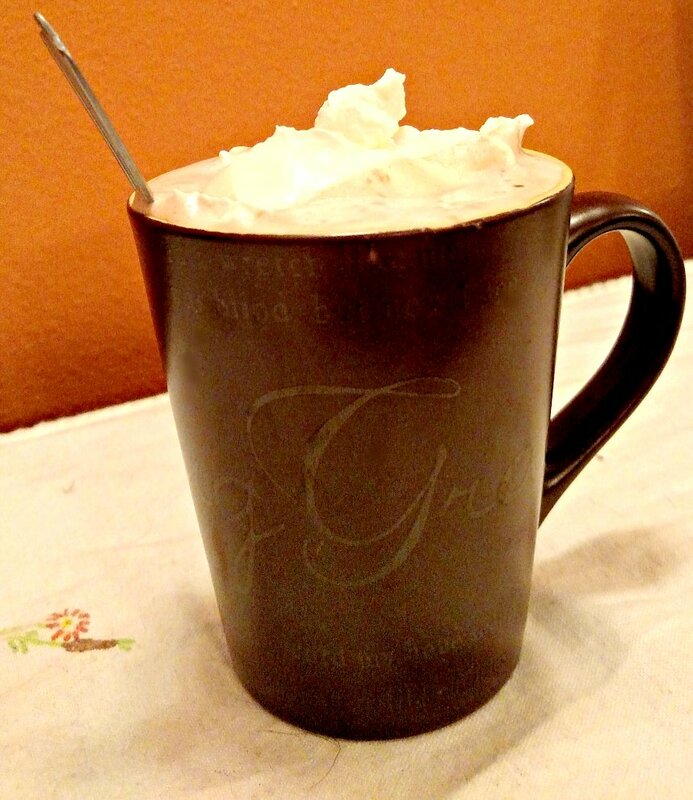 Best low carb hot chocolate ever! 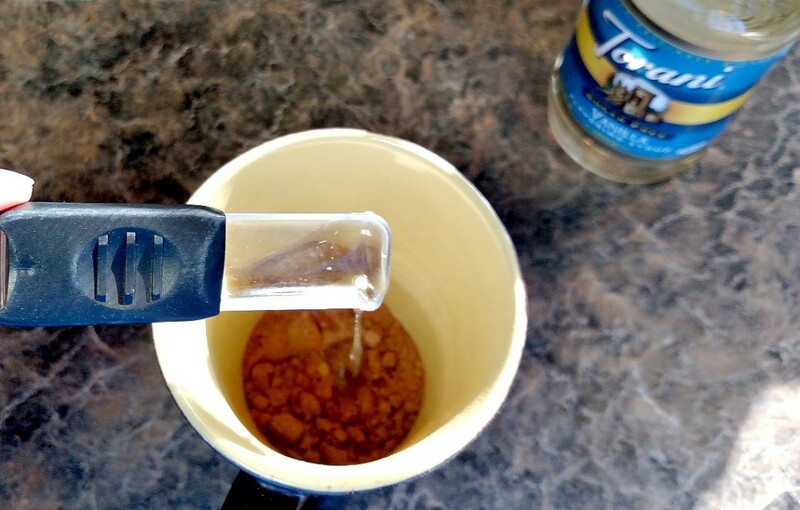 How to Make Low Carb Hot Chocolate Taste Amazing! I really hate the way that cocoa clumps when you put it in a liquid. In one recipe I tried, they mixed Torani sugar free syrup with the cocoa before adding the coconut milk. It turned into a type of chocolate syrup and mixed right up into the milk. Another bonus, it’s sugar free and I didn’t have to use an additional sweetener. To top off my homemade low carb hot chocolate recipe, I made whipped cream, sweetened with more Torani, with my immersion blender . But you could also add low carb and sugar free LaNouba marshmallows ! 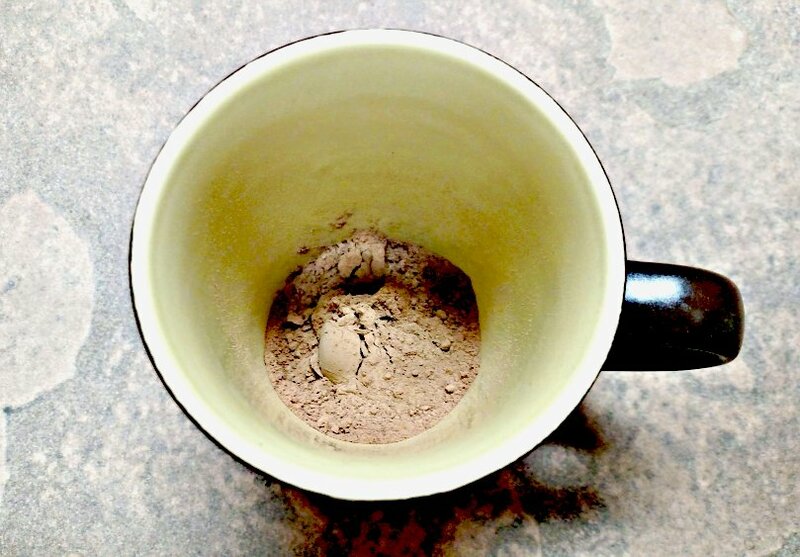 To make low carb hot chocolate, first I added 2 tbsp cocoa to a small coffee mug. You can use a fork to break up any clumps. Since cocoa never gets quite mixed in with a liquid, I decided to eliminate that problem by adding 3 tbsp Torani vanilla syrup . This stuff is awesome! I’ve heard of Torani, but never tried them until now. I really don’t know how I’ve lived life in my low carb journey before now. Now stir the cocoa and vanilla syrup together until it forms a smooth paste. It should be almost the consistency of melted chocolate. Be sure to break up all clumps and incorporate the cocoa fully. Set aside. Now add one cup of coconut milk to a saucepan and heat on low. You can use almond milk, or even regular milk if you like, just keep in mind this will change the carb count a bit. Pour hot milk into the cup with the chocolate mixture and stir well. 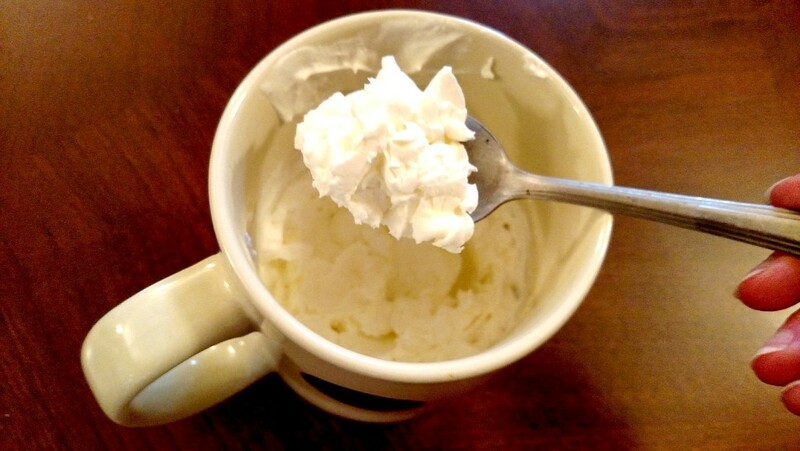 Top with low carb LaNouba marshmallows , or you can try my homemade whip cream recipe. 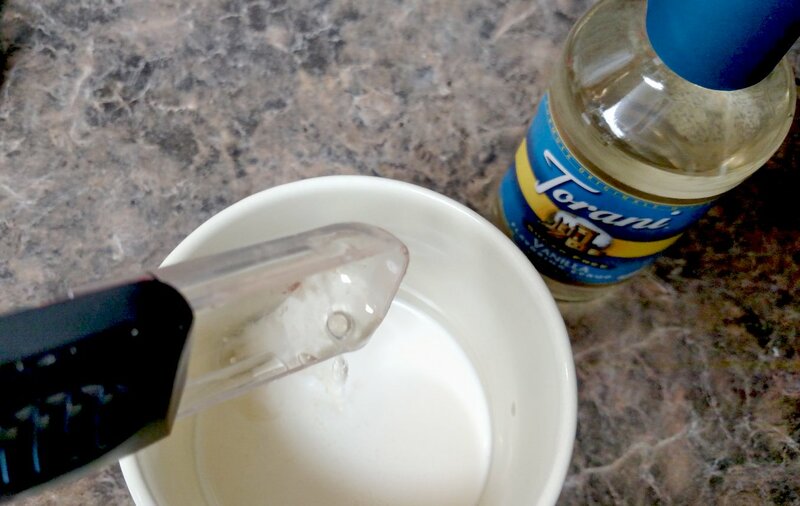 Add 1 tbsp Torani vanilla syrup to 1/2 cup heavy whipping cream in a small, high sided cup. 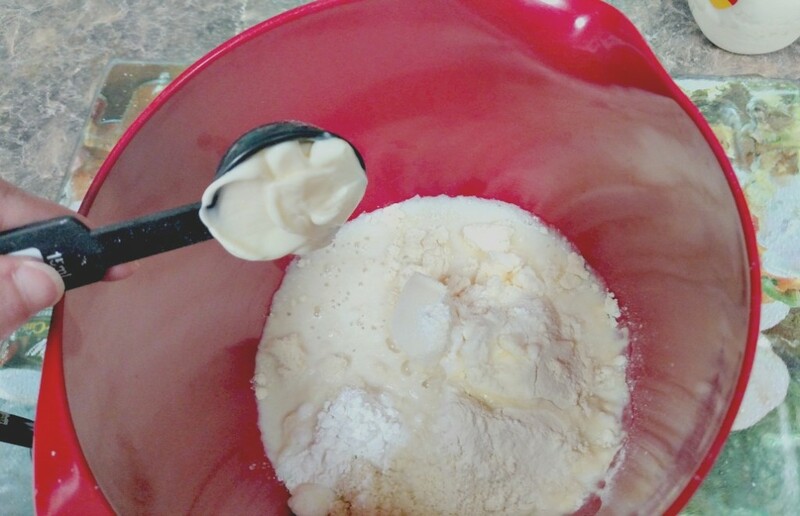 Use your immersion mixer (it’s a low carb cook’s best friend!) and blend until thick and creamy, about 30 seconds. This is how it should look when you’ve beat it enough: Thick and creamy and luxurious homemade whipped cream! It is heavenly on your hot cocoa. 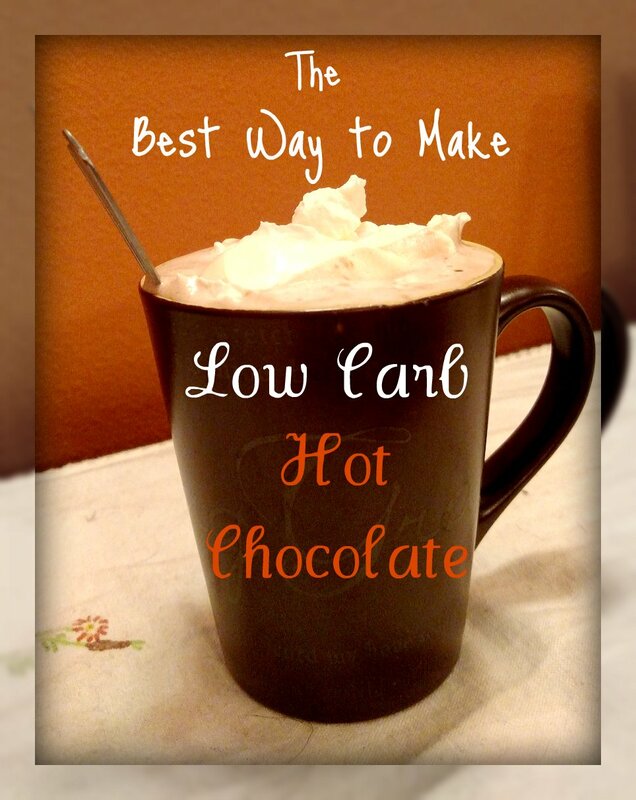 Now you know how to make low carb hot chocolate! 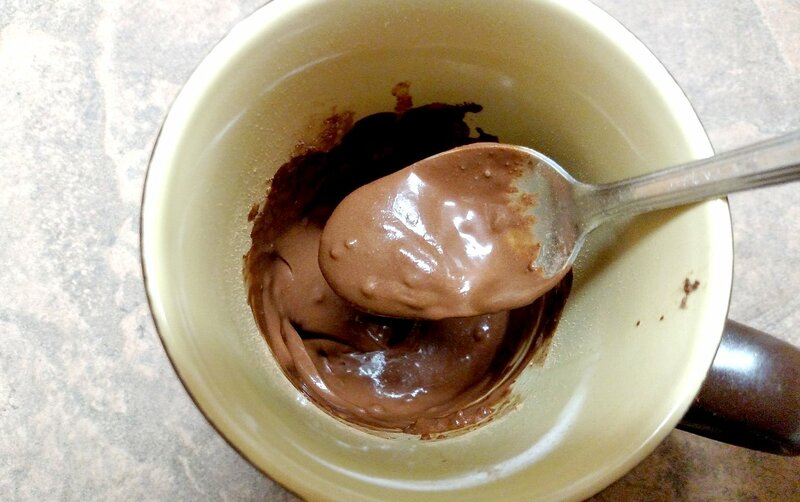 Mix the cocoa and the syrup in a medium sized mug until smooth. Be sure that there are no lumps. 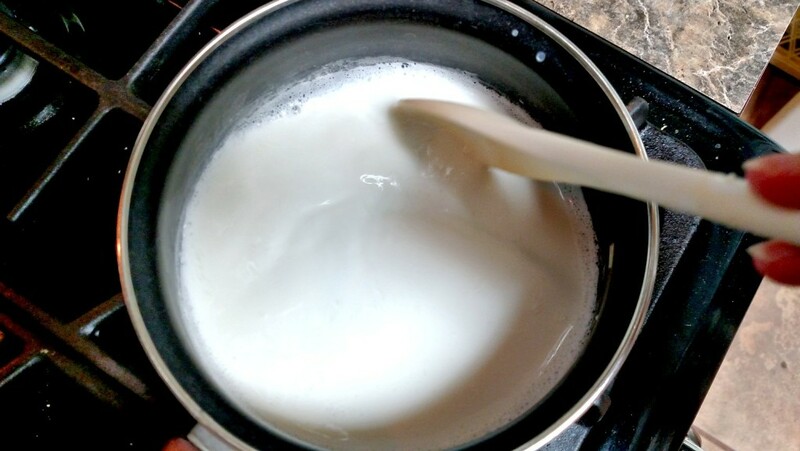 Heat the milk on low heat until hot. 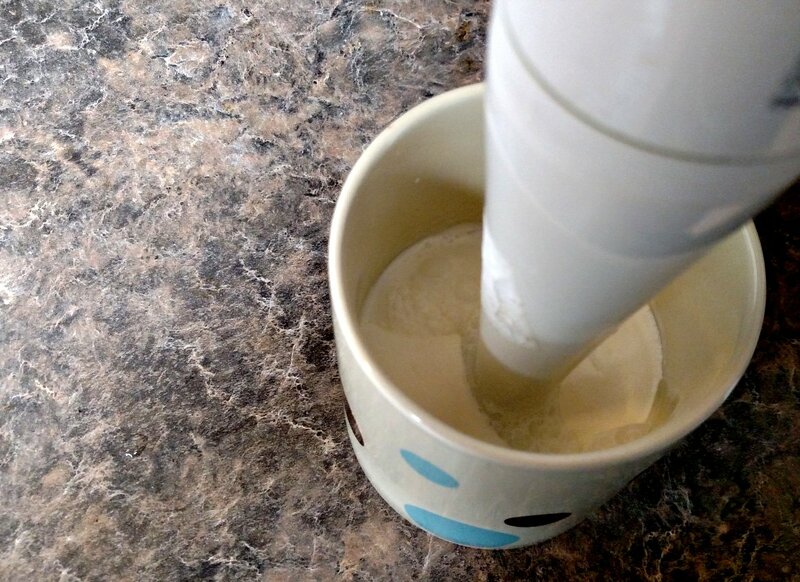 Pour the milk into the mug and mix well. Top with low carb marshmallows or whipped cream. Using your immersion blender beat the cream and the syrup until stiff. 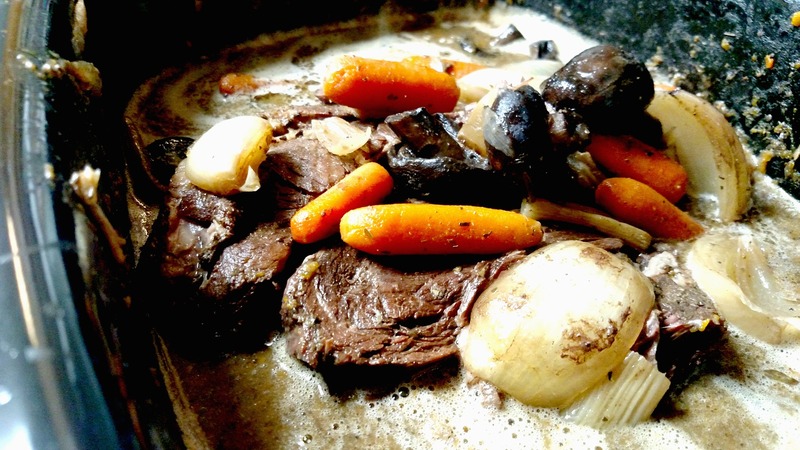 Thanks to Alice for the Best Slow Cooker Pot Roast Recipe! One of the things I love most about food, it’s the relationships it can represent. Just like certain foods can remind you of a certain family member or moment in time, recipes can also represent a bond between friends. More than likely I’m probably still that annoying little sister when we’re able to get together, but we love every minute of it! A few years ago when she was coming up to get her mother’s house ready for sale, my son was over helping her out. One day she made him her famous pot roast. He came home raving about it. It’s been years, but my son still talks about that dang roast. Alice’s original recipe was one packet ranch dressing, one packet Italian dressing, and one packet brown gravy mix. Hidden Valley Ranch packets are gluten free and low carb, so I was able to keep that. However, the Italian and brown gravy mixes are not gluten free. I realize you can buy gluten free brown gravy, but they can be higher in carbs. 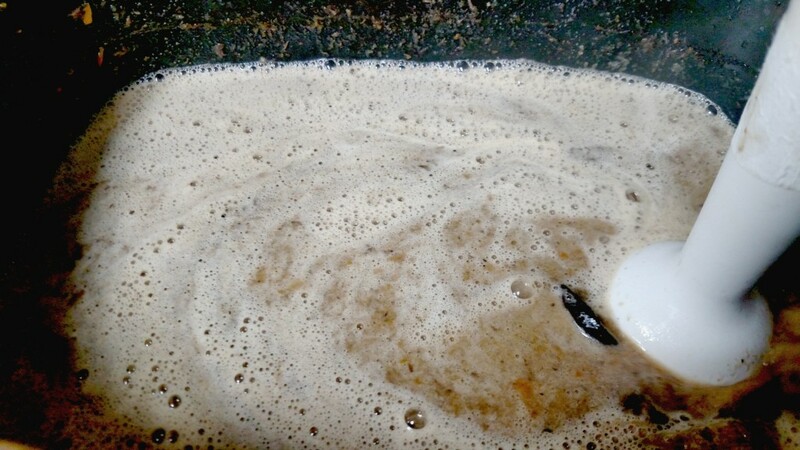 I know the purpose of the gravy mix is to thicken the roast juices into a yummy beefy tasting gravy. But in low carb cooking, the easiest way to thicken a gravy is to use an immersion blender . (My go-to appliance in the kitchen!) To add the extra beefy taste, I used beef base . After slow cooking in my crock pot for seven hours, I tasted the most tender, scrumptious roast I’ve had since my mother stopped cooking. First, the basics. 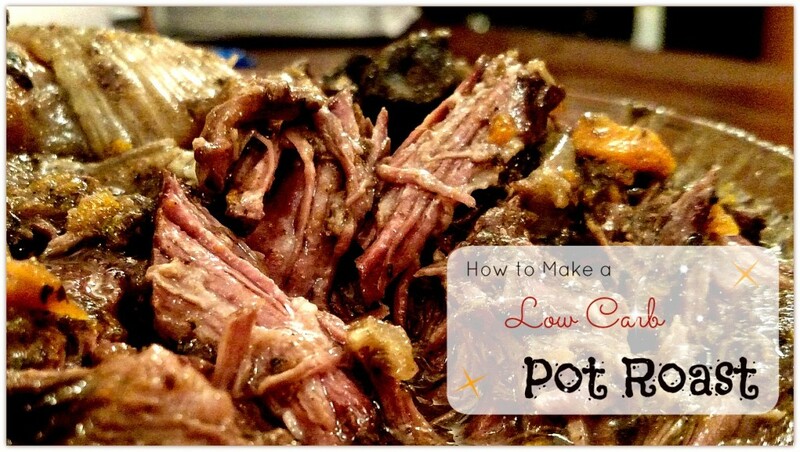 Place a one to two pound roast into your crock pot. The cut doesn’t really matter. 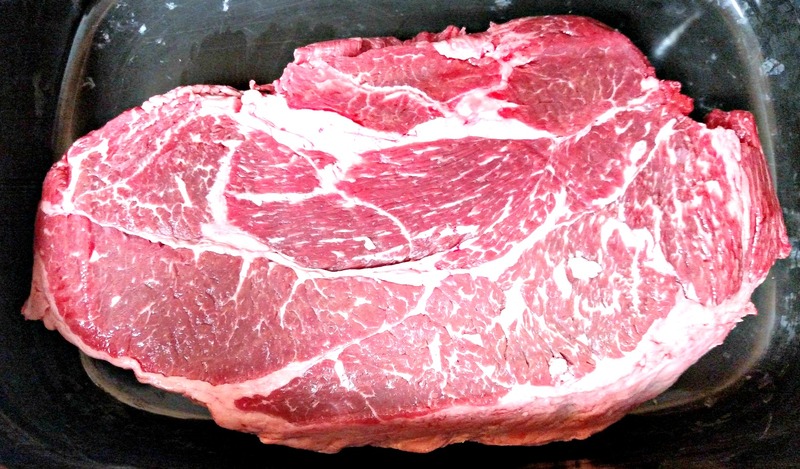 Today, I used a chuck roast because it was on sale. 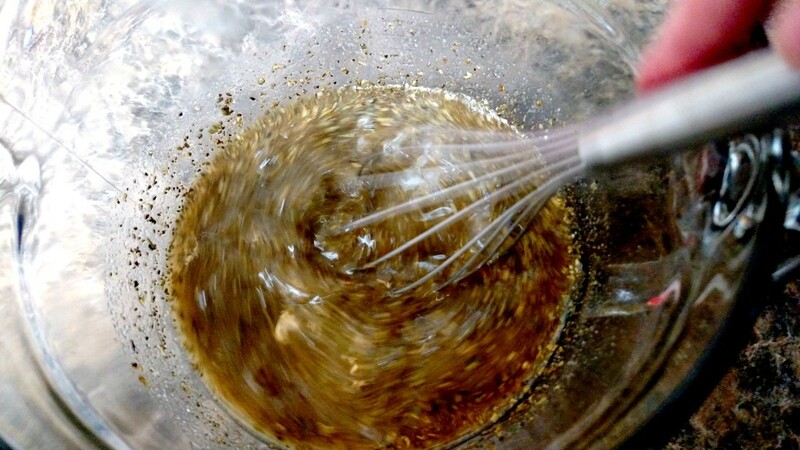 Dissolve the beef base in one cup boiling water. Add the ranch dressing packet, salt, pepper, and spices. Whisk well and pour over the roast. Add another cup of boiling water to the crock pot. Now it’s veggie time! Add your favorite vegetables to the top of the roast. Yeah, I know carrots aren’t exactly low carb, but sometimes I just want a carrot, okay? Cook on low for six to eight hours. If you want to thicken the juices and make a low carb gravy, remove the roast and most of the vegetables. Use your immersion blender and blend in the remaining vegetables until the broth is thickened. Return the roast and vegetables and serve your family the best gluten free beef roast they’ll ever eat! Dissolve beef base in one cup boiling water. Add ranch dressing packet and remaining herbs and whisk well. Pour over roast and add one more cup boiling water. Cover and cook on low for six to eight hours. Remove roast and most of the vegetables. 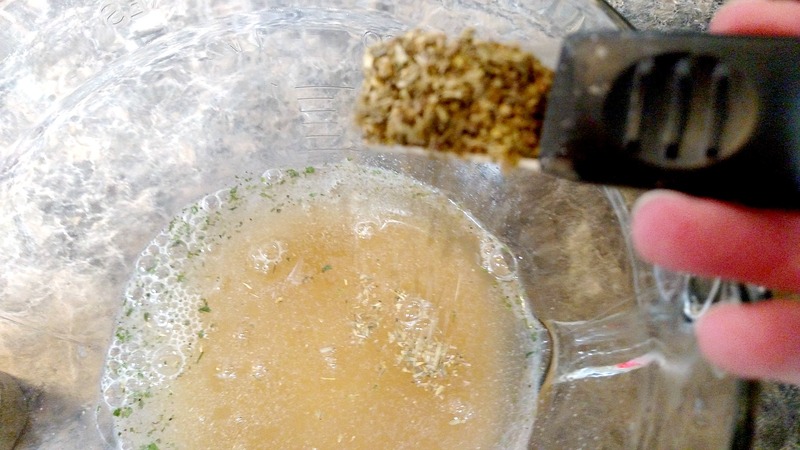 Use an immersion blender to blend in remaining vegetables to make a thick gravy, if desired. 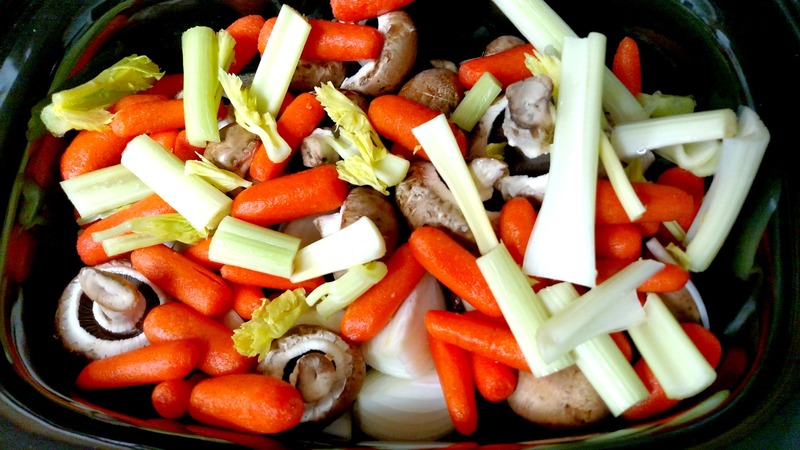 Return roast and vegetables to the crock pot and serve. I’ve had a life long love affair with bread. 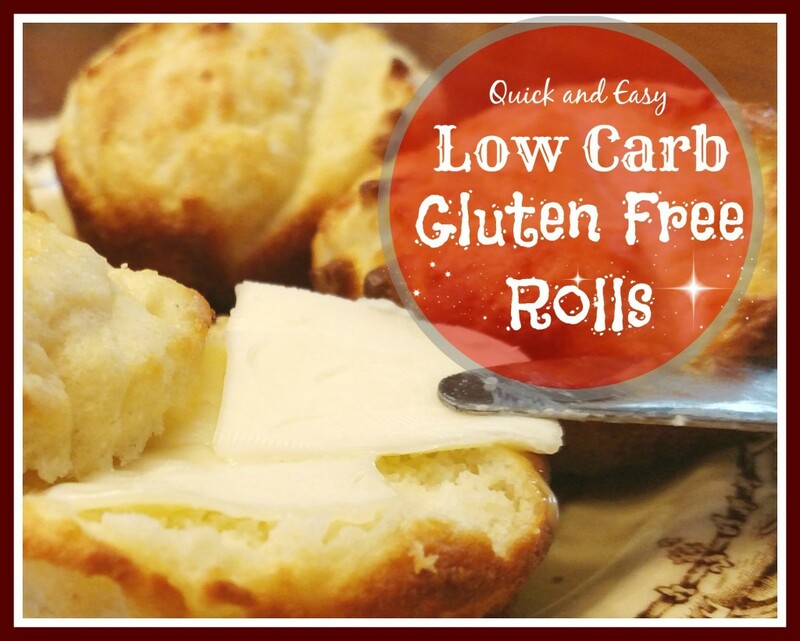 Something that’s not good for someone who is low carb and gluten free unless you can find a good low carb gluten free rolls recipe. 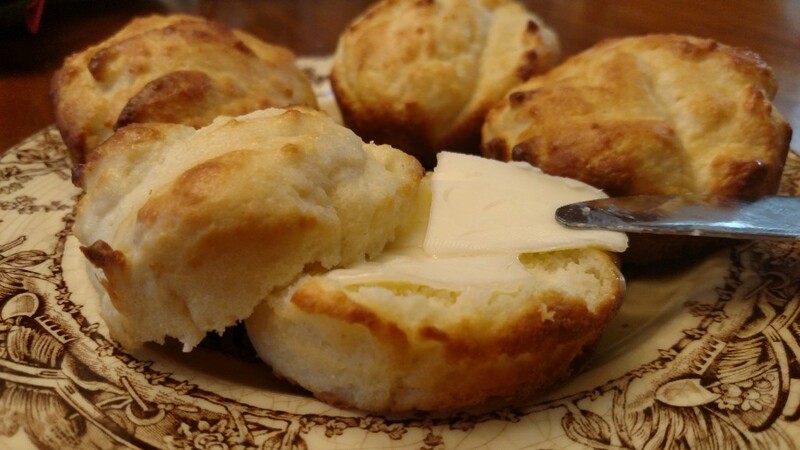 The good recipes are few and far between, and being low carb hasn’t hampered my love for buttery fluffy goodness. But I have to say, I came by my love for bread honestly. My next door neighbor growing up was an old lady named Mrs. Wentz. She was sort of my surrogate grandma since mine lived so far away. Hers is the first homemade bread I ever tasted, and when I was old enough she taught me how to make my very own loaf. As a teenager, I became the resident bread baker at my house. I was not and never have been picky when it comes to bread. Slop it with a Paula Deen amount of butter on it and I was in hog heaven. My favorite to make, of course, used to be yeast breads, but back then on days when I decided I wanted rolls for dinner. say. 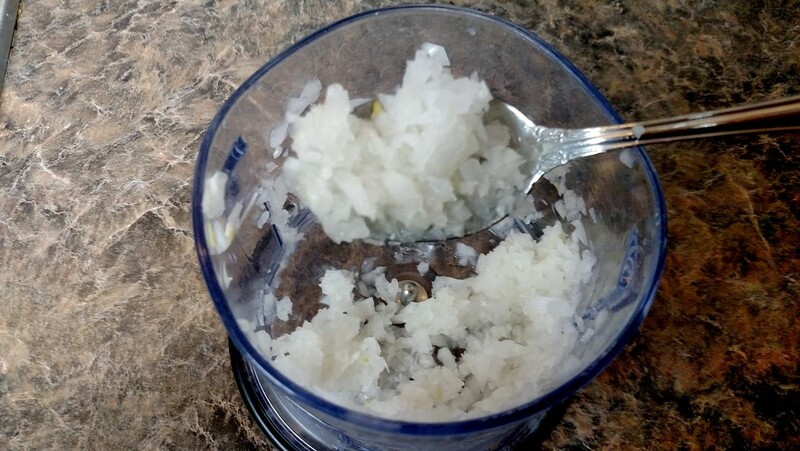 at 4pm, my favorite recipe was a quick no-yeast bread recipe that used mayo. I had all but forgotten about that recipe until a few weeks ago when it came across my Facebook feed. Oh, my gosh, I could taste those rolls looking at that pic. But then I wondered, would I be able to turn it into a gluten free low carb bread recipe? I know it’s harder than heck to bake low carb bread that tastes more like bread and less like cardboard, but I wanted to try to remake that recipe so I could enjoy easy, more importantly tasty, last minute low carb gluten free rolls. I decided the wet ingredients were pretty standard for both a regular bread recipes and a homemade low carb bread recipe, so I kept them the same. The hard thing to do was how to handle the type and quantity of the flour. A lot of gluten free low carb bread recipes end up tasting more like cardboard and less like bread. But I decided to go for it anyway. You never know unless you try, right? Once I tried a homemade low carb bread recipe that used a blend of almond flour and protein powder that was really successful, so I decided to try that method. I got lucky, and got the right ratio on my first try. Now I’m not going to lie and say it has the same texture and taste as the easy no yeast dinner roll recipe I made when I was a teenager. Its consistency is a cross between a biscuit and a yeast roll. It’s a moist bread, and I believe that comes from the mayo. It is the best tasting gluten free low carb bread recipe I’ve made in a really long time. What I think sets this recipe apart from other gluten free low carb bread recipes is that it’s not a complicated recipe and there’s no steps. You just throw all the ingredients in the bowl, mix, and put in a silicone muffin pan. (Which I love btw!) It’s simple. I love simple. Grease a six muffin tin. I used a silicone muffin pan , so I was able to skip this step. I love me some silicon bakeware! 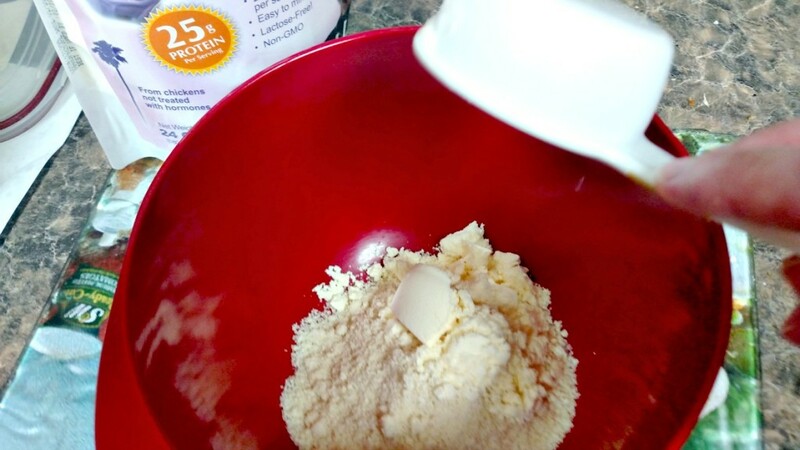 Next, in a small bowl, mix 1 cup almond flour and 1/4 cup unflavored protein powder . I used Jay Robb. Finally, divide dough evenly in the muffin pan. Bake at 350F for 20 minutes or until brown. Butter and enjoy! Grease a 6 hole muffin tin, or use a silicone muffin pan and skip a step! In a small bowl, add the dry ingredients and mix well. 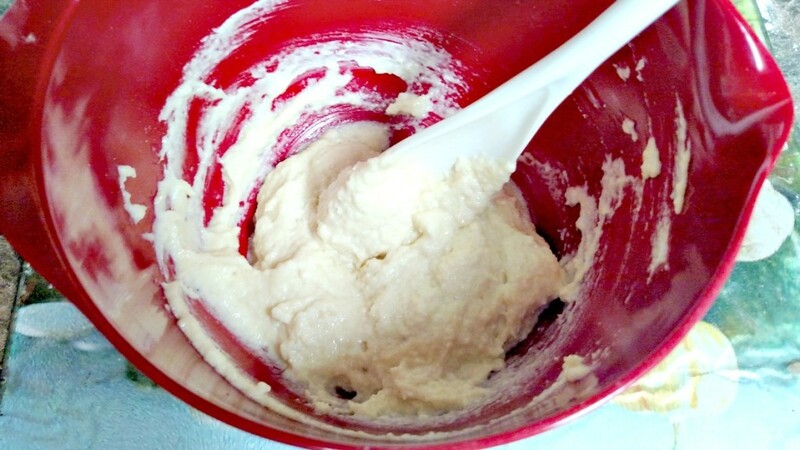 Next, add wet ingredients and mix until it just starts to form a sticky dough. Evenly fill the muffin tin and bake for 20 minutes, or until done. Brown the rolls under the broiler until it's a golden brown, if desired.